This Blog post outlines how I evaluate company management and uses my share portfolio for examples. For the first part of the study I assess management loyalty and commitment (through a sizeable ordinary shareholding). I then look at management capability and track records. I have ranked my 16 holdings into three groups based on tenure and shareholdings. These are the companies where the lead executive has generally been in charge for a long time and has a substantial amount of money riding on the share price. You may have spotted that Mincon chief exec Joseph Purcell has the shortest tenure as a boss at just two years. However, he did serve as chief technical officer from 1998 while his father (currently a Mincon non-exec) was in charge between 1977 and 2012. As such, Mr Purcell ought to have a good understanding of how to run the business. Otherwise, I would say those eleven shares appear to be textbook holdings for me — at least on a management loyalty and commitment basis. These are the four holdings where the chief exec does not offer a long tenure or a significant shareholding (or both). both a long executive history and significant shareholding (e.g. Record). I would like to think these chairmen would look to protect their investments (and mine) by appointing a fresh chief exec should the need ever arise. So far at least, none of these ‘salarymen’ chief execs has let me down too badly. 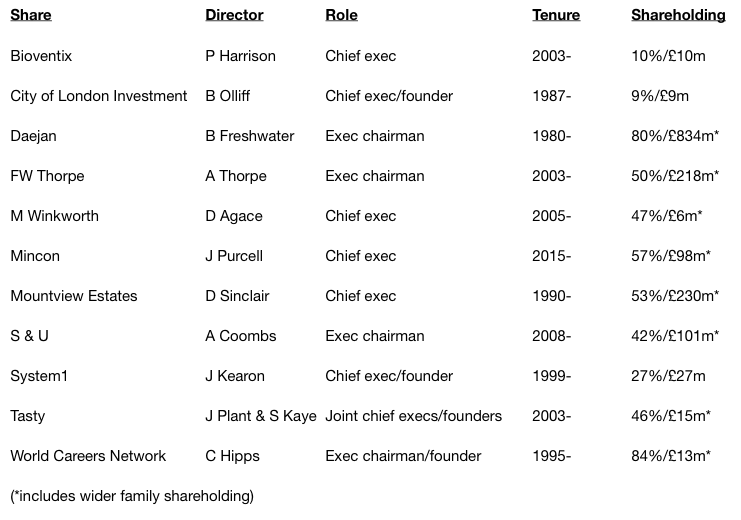 There is no getting away from this… various board changes have left a new chief exec — who owns no shares — running the show. Not even a major shareholder sits on the board, either. Getech’s founder still holds 10% but he left the company a few years ago. But these days, such ‘barriers to entry’ appear increasingly at risk of being challenged by intrepid startups that can use the Internet to gain customers much more quickly than ever before. This investment paper cites a good example of Gillette and Dollar Shave Club. Over time then, I have become far more convinced about the importance of management ‘knight’s to an investment. Put simply, I would like to think a business is more likely to enjoy long-term success — and fend off intrepid startups from crossing the ‘moat’ — with a loyal and committed executive at the helm. Of course, investing in a business that’s led by a long-time executive with a major shareholding is no guarantee of stock-market success. …but that did not prevent those shares losing me money or struggling for years to deliver a gain. The next part of my analysis was not at all straightforward. To be honest, I was not entirely sure how to accurately measure the leadership talent at my 16 shares. Let’s begin with the two A+ all-stars of this part of the study. S&U is not the easiest firm to evaluate, given it sold one of its two divisions the other year. I have therefore assessed Anthony Coombs mostly on the performance of the remaining Advantage Finance operation, which has grown very quickly since he became executive chairman during 2008. My ‘B’ verdicts for Jonny Plant and Sam Kaye at Tasty, and Charles Hipps at World Careers Network (now renamed Oleeo (OLEE)), were influenced by both companies having transformed from loss-makers into profit-makers. In retrospect, I may have been a little harsh on Dominic Agace of Winkworth. I gave him a ‘C’ because his tenure at the top is not as long as some of the others, while profit at his firm remains quite low at £1.3m. I reckon Mr Agace will enjoy a rating upgrade should earnings advance in due course. However, it was not difficult to mark James Wood-Collins with an ‘E’. Mr Wood-Collins is the only boss in my review to have stewarded an overall profit downturn during his leadership. This capability and track-record analysis was not a straightforward exercise. the company has already suffered difficulties and a new leader could turn things around. Disclosure: Maynard owns shares in Andrews Sykes, Bioventix, Castings, City of London Investment, Daejan, Getech, Mincon, Mountview Estates, Oleeo, Tasty, FW Thorpe, S&U, System1, Tristel and M Winkworth. This entry was posted in How To Evaluate on January 14, 2019 by Maynard Paton.